Simon & Schuster, 9781476730776, 320pp. 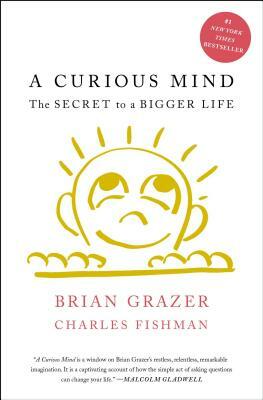 #1 New York Times bestselling author and Oscar–winning producer Brian Grazer has written a brilliantly entertaining and eye-opening exploration of curiosity and the life-changing effects it can have on every person’s life. From Academy Award–winning producer Brian Grazer, New York Times bestseller A Curious Mind offers a brilliant peek into the “curiosity conversations” that inspired him to create some of the world’s most iconic movies and television shows. He shows how curiosity has been the “secret” that fueled his rise as one of Hollywood’s leading producers and creative visionaries, and how all of us can channel its power to lead bigger and more rewarding lives. Grazer has spent most of his life exploring curiosity through what he terms “curiosity conversations” with some of the most interesting people in the world, including spies, royals, scientists, politicians, moguls, Nobel laureates, artists…anyone whose story might broaden his worldview. These discussions sparked the creative inspiration behind many of his movies and TV shows, including Splash, 24, A Beautiful Mind, Apollo 13, Arrested Development, 8 Mile, J. Edgar, Empire, and many others. A Curious Mind is not only a fascinating page-turner—it also offers a blueprint for how we can awaken our own curiosity and use it as a superpower in our lives. Whether you’re looking to strengthen your management style at work, uncover a new source of creativity, or become a better romantic partner, this book—and its lessons on the power of curiosity—can change your life. Brian Grazer is an Oscar-winning producer and New York Times bestselling author. His films and television shows have been nominated for forty-three Academy Awards and 187 Emmys. His credits include A Beautiful Mind, Apollo 13, Splash, Arrested Development, 24, Empire, 8 Mile, J. Edgar, The Da Vinci Code, Parenthood, Friday Night Lights, American Gangster, and Genius, among others. He is the author of Face to Face and the New York Times #1 bestseller A Curious Mind: The Secret to a Bigger Life and was named one of Time’s 100 Most Influential People in the World. Grazer is also the co-founder of Imagine Entertainment along with his longtime partner, Ron Howard. Charles Fishman is the acclaimed author of One Giant Leap, A Curious Mind (with Brian Grazer), The Wal-Mart Effect, and The Big Thirst. He is a three-time winner of the Gerald Loeb Award, the most prestigious prize in business journalism. "A Curious Mind is a window on Brian Grazer's restless, relentless, remarkable imagination. It is a captivating account of how the simple act of asking questions can change your life." "It'll encourage you and your partner to engage in novel conversations." “Grazer’s book is conversational, funny and inspiring. A business book like this one can be an excellent resource when it provides a different perspective of thinking and taking action."